Today, about 8 out of 10 bottles and cans that are sold in Sweden go on to be recycled in stores. But even if the whole world recycled like the Swedes do, we would still need 4,2 planets to make up for the waste. Good news is that even though the number of sales of bottles and cans has increased recycling stays at a steady 80%, a 10% difference from the country’s 90% goal. Sara Barthelson Riismark, Communication Manager at Returpack (Sweden’s Recycle Agency), says that people have different reasons for wanting to recycle, but almost all Swedes are positive towards the recycling system. 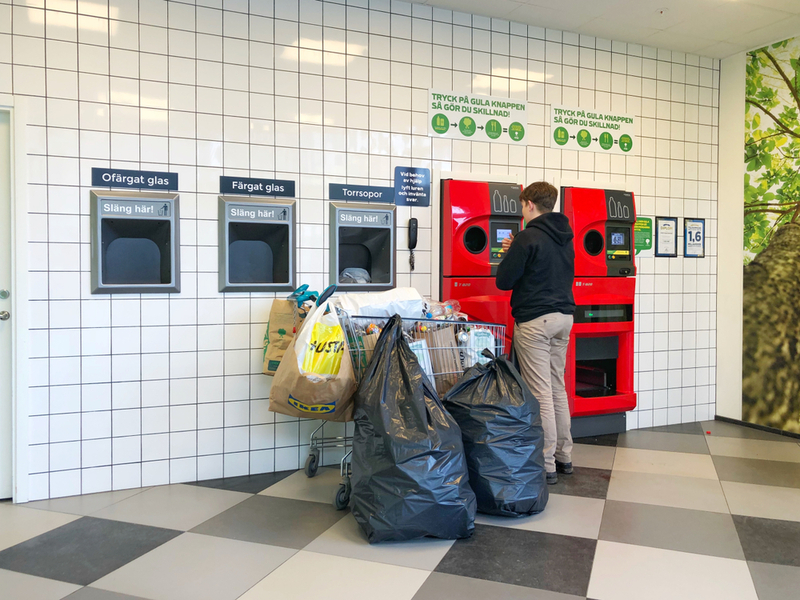 In Sweden, all regular grocery stores have recycling machines, and almost all bottles and cans can be recycled for about 10-20 cents per item. More than 9 out of 10 large bottles are recycled, but seen to smaller bottles and cans, the results aren’t as great. It’s often the smaller bottles, that people buy “on the go” that are thrown away in general garbage cans or on the ground instead of being recycled. Last year, 1,85 million bottles and aluminum cans were recycled, which is around 183 bottles or cans, per person.